The sun shone on a purple flower at the edge of the yard. Huldah Hartz’s mama liked to have pretty flowers on the table. “I know she would like this big one!” Huldah tugged and twisted its thick stem. Sophie, Huldah’s little sister, ran toward Mama, her bare heels kicking high and her blond braids, just like Huldah’s, bouncing. Grasshoppers jumped out of her way. “Coming!” Huldah called. As she pulled on the flower, an orange and black butterfly flitted around her head. “It’s so pretty! I wonder where it lives.” When it flew past, she followed all the way to the tall grass next to the shadowy forest. 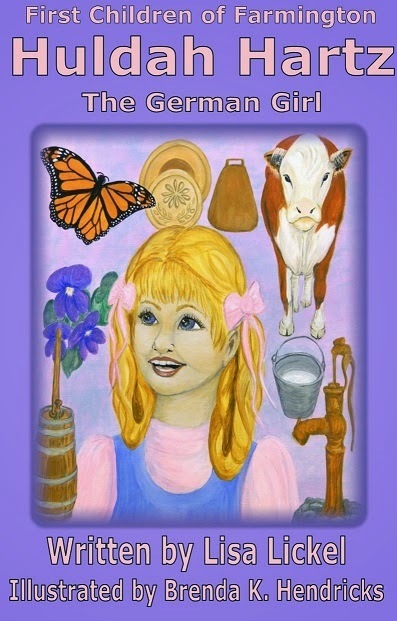 Huldah leaned close to watch the butterfly land on an orange flower and stick its long black curly nose right inside. Or was that a tongue? What was it eating? Did it taste good? A hand gripped Huldah’s arm and gently pulled her away. “I called and called for you,” Mama said with a frown. Blue-eyed baby Wilhelm wiggled in her arms, showing his fat tummy under his white shirt. Sophie held Mama’s blue striped apron strings like a puppy’s leash. Wilhelm waved his chubby arms and Huldah let him grab her thumb. Huldah held Sophie’s hand and waved her other arm like a wing. They skipped on the way to the cabin. What a grand life a butterfly must have. Huldah’s tall papa hugged her and twirled her in circles, and tickled her with his mustache kisses. She giggled and so did Papa. Papa winked and set Huldah next to Sophie. “I had a busy day today,” he said. “I bought a cow from Cousin Herman. She is pretty and brown, with long eyelashes.” He set bowls of stew Mama ladled in front of her and Sophie. Huldah breathed in the scent of cooked vegetables from their little garden: turnips, carrots, and onions. After dinner, while Papa told a story to Sophie and Wilhelm, Huldah helped her mother clear the table. “I haven’t seen you make butter since I was a little girl, Mama. I forgot how,” Huldah said. Huldah walked to the old wooden barrel that was their churn. It stood in the corner waiting to be used. A round pole poked up from the middle, as high as her waist. She gripped the smooth round handle of the dasher and worked it up and down. Papa watched them with a twinkle in his eyes. “Huldah will have to put on her patience,” he said.